Polly beak deformity is a complication of rhinoplasty defined by the typical appearance of a dorsal nasal convexity resembling a parrot's beak. [1, 2, 3] This dosal hump is located in the supratip region of the nose which then "pushes" the tip downward causing under-rotation. It can occur through several mechanisms. If during the intraoperative evaluation of the nose, a surgeon does not recognize the improper tip-supratip relationship that is the hallmark of this deformity, a polly beak occurs. In addition, polly beak deformity may develop because of the inability of a surgeon to precisely predict the ultimate healing of the nose. Supratip (arrow) and tip-defining point (cross). In patients, especially those with a thick skin soft tissue envelope, excess scar tissue can form in the supratip. This will produce a similar effect. Two general categories of a polly beak deformity are described. Each can result as a consequence of 1 or more conditions. During surgery, excess edema often obscures the deformity. After surgery, scar tissue can replace edema of the supratip. Patients with a polly beak deformity are generally dissatisfied with the birdlike appearance of their nose. Many patients report that their nose was massively swollen after surgery and that they noticed the deformity after the swelling resolved. In the case of loss of tip support, patients notice that the nose initially looks fine but that it evolves into a deformed profile. A clear understanding of the support mechanisms for the nasal tip, maintaining them, and reconstructing disrupted elements of tip support are paramount to preventing the eventual settling of the tip that occurs when these mechanisms are disturbed. Most of the healing from a rhinoplasty procedure takes a full year to complete, though the nose continues to change over a lifetime. In general, the outcome should not be critically assessed until a year after surgery. Delaying treatment of a polly beak deformity for a year is prudent; this delay allows the normal healing process to occur. A delay or more than a year may be necessary in patients with thick skin. Secondary or revision rhinoplasty is indicated in patients who have an obvious deformity that will not heal in a satisfactory manner. Surgery is indicated in patients who have a soft-tissue polly beak that is unresponsive to steroid injection. The supratip is defined as an area of thick skin above the nasal tip (see the images below). The cartilaginous dorsal septum composed of quadrangular cartilage supports the supratip. The supratip region is an area of thick skin. The nasal tip is composed of lower lateral cartilages. The most anterior point of the nasal tip, eg, the junction of the lateral and intermediate crus, is known as the tip-defining point. Understanding the normal relationship of the tip and the supratip region is paramount to predict the outcome of rhinoplasty. 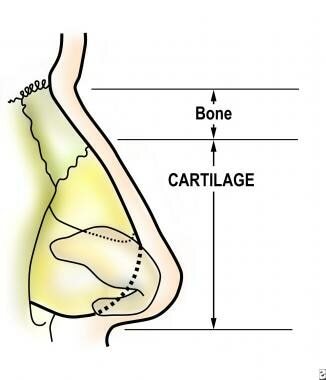 The nose may be divided into horizontal thirds, with the upper one third composed of bone and the lower two thirds composed of cartilage (see the image below). The thickness of skin varies according to the region of the nose. The nose can be divided into horizontal thirds; the upper third being bony and the lower two thirds being cartilaginous. In the normal nose, the tip-defining point should be approximately 6-10 mm anterior to the dorsal septum (eg, supratip) to have a supratip break. The skin in the area of the supratip is thick; take this into account when aligning the patient's profile. In men, a straight-line profile might be preferred. A straight-line profile helps minimize a height discrepancy between the tip and the supratip. Correction of a polly beak deformity is contraindicated in patients with clinically significant medical problems that may preclude safe surgery or in patients in whom psychological factors make further surgery unwise. Take care when reducing the nasal dorsum in a patient with a septal perforation. Gubisch W, Eichhorn-Sens J. Overresection of the lower lateral cartilages: a common conceptual mistake with functional and aesthetic consequences. Aesthetic Plast Surg. 2009 Jan. 33(1):6-13. [Medline]. Harsha BC. Complications of rhinoplasty. Oral Maxillofac Surg Clin North Am. 2009 Feb. 21(1):81-9, vi. [Medline]. Christophel JJ, Park SS. 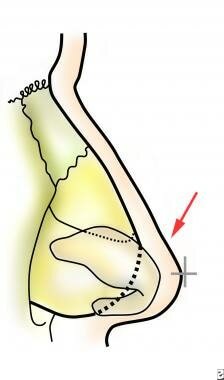 Complications in rhinoplasty. Facial Plast Surg Clin North Am. 2009 Feb. 17(1):145-56, vii. [Medline]. Arslan E, Gencel E, Pekedis O. Reverse nasal SMAS-perichondrium flap to avoid supratip deformity in rhinoplasty. Aesthetic Plast Surg. 2012 Apr. 36(2):271-7. [Medline]. Slupchynskyj O, Rahimi M. Revision rhinoplasty in ethnic patients: pollybeak deformity and persistent bulbous tip. Facial Plast Surg. 2014 Aug. 30 (4):477-84. [Medline]. Conrad K, Yoskovitch A. The use of fibrin glue in the correction of pollybeak deformity: a preliminary report. Arch Facial Plast Surg. 2003 Nov-Dec. 5(6):522-7. [Medline]. Foda HM. Rhinoplasty for the multiply revised nose. Am J Otolaryngol. 2005 Jan-Feb. 26(1):28-34. [Medline]. Hanasono MM, Kridel RW, Pastorek NJ, et al. Correction of the soft tissue pollybeak using triamcinolone injection. Arch Facial Plast Surg. 2002 Jan-Mar. 4(1):26-30; discussion 31. [Medline].